Introduction to the two steps in poverty measurement: identification and aggregation. Definition of the different types of axioms (properties) for poverty measures. 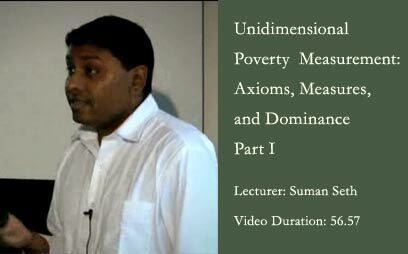 Properties of well-known unidimensional poverty measures and policy implications. Unidimensional stochastic dominance (dominance conditions and their connection to poverty measures). 11:58 Identification: who is poor? 21:00 Aggregation: What is the level of poverty? 22:23 The list of axioms from Foster (2006), which properties do you want your measure to have? 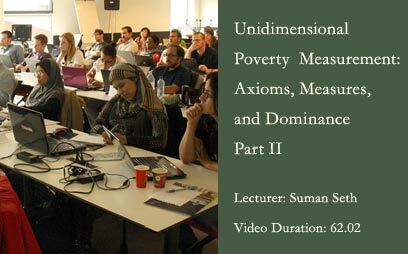 Watch a presentation by Suman Seth on Unidimensional Poverty Measurement from OPHI’s 2014 Summer School in Oxford. Alkire, S., Foster, J. E., Seth, S., Santos, M. E., Roche, J. M., and Ballon, P. (2015). 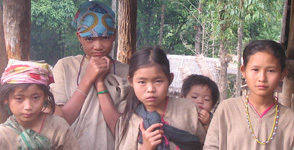 Multidimensional Poverty Measurement and Analysis, Oxford: Oxford University Press, ch. 2. Foster, J.E. and Sen, A. (1997). On Economic Inequality: After a Quarter Century. Annex to the Expanded Edition of A. Sen. On Economic Inequality. Oxford: Clarendon Press. Section A.6.